Albert Kim, a self described "intentional loser", is sick of high school drama. He'd rather be an outcast than have to deal with having a social life, especially after all the injustices that have been dumped on him during his high school years. But these sentiments seem to be nearly forgotten when Albert meets Mia, who is confident and popular. Before Albert knows it, he and Mia are together. And then...Mia's ex, Ryan, is diagnosed with cancer. Suddenly he desperately needs Mia to be at his side, a fact of which Albert is certain is payback and an attempt to get her back. Unable to say anything against Ryan, everyone's heroic champion, and desperate for Mia's company—the only person he feels truly alive with—Albert finds himself locked between a rock and a hard place. 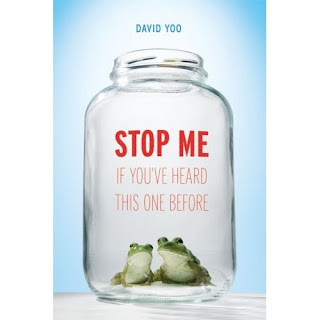 Stop Me If You've Heard This One Before is a humorous, ironic, and completely entertaining read that really hits the mark. Albert is an engaging and thought provoking character whose unique voice is hard to resist and his outlook on life is one that many teens will be able to relate to. The pacing of the story is ideal: it moves at just the right speed to keep the reader's attention, but not so fast that it feels as if the story is rushed, and the plot is credible. Readers will find themselves easily empathizing with Albert as Ryan gets showered with attention and Mia finds herself hopelessly confused, and Albert grows a little wiser along the way. Stop Me If You’ve Heard This One Before genuinely and candidly captures the heartaches, thrills, and lows of being in love and growing up. I'm glad to hear a good review because I've been interested in reading this book for a while. I like the sound of this one. I'm in a big YA fix at the moment. I really, really loved this book. I've been bugging people to read Dave's book for months, and I'm really glad to see it on your website. Oh, and Dave's other book, "Girls For Breakfast" was really great, too.